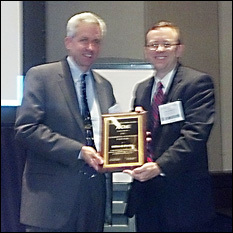 BioE Professor and Chair William E. Bentley (left) receiving his award at the AIChE conference. The American Institute of Chemical Engineers (AIChE) has announced that Fischell Department of Bioengineering (BioE) Professor and Chair William E. Bentley has received the society's 2012 Food, Pharmaceutical and Bioengineering Division (FP&BE) Award in Chemical Engineering. The award "recognizes an individual's outstanding chemical engineering contribution in the food, pharmaceutical and/or bioengineering industry," government, academia, or with other organizations. Bentley was invited to speak at the FP&BE Division's plenary session at the 2012 national meeting of the AIChE, held in October in Pittsburgh, Pa. His talk, titled "Building the Biotechnology Toolbox: At the Intersection of Biofabrication and Synthetic Biology," discussed his group's work in using a form of intercellular communication known as quorum sensing to control and direct cell populations, particularly in the area of facilitating interaction between electronics and synthetic biology.